Before we commence our book review today, allow me to thank you for the thoughtfulness with which you responded to my unloved Friday finish. If you haven’t had a chance, you should definitely review all the comments (one of my most-commented posts to date). I really enjoyed the exercise and I’m so glad that you felt comfortable engaging in it with me. I don’t know if I’ll have a chance to respond to so many comments (packing up my family to leave on vacation Thursday!) but please know that I absolutely read and thought about each and every one. Now let’s review a book! Michelle from Factotum of Arts asked me to write a post as part of her Book Review Tuesday series and I was more than happy to oblige, particularly because it gives me the perfect excuse to go on about one of my personal quilt idols: Sarah Fielke. 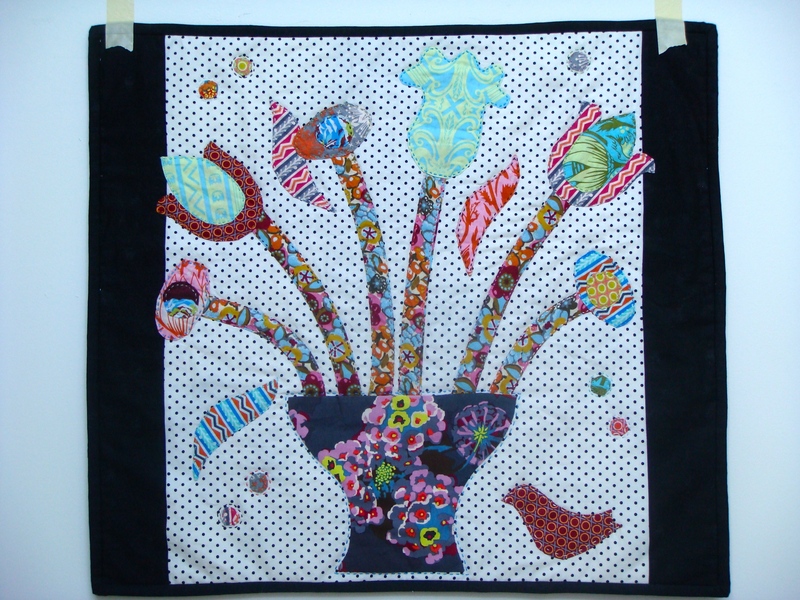 I was first introduced to Sarah Fielke’s work when a couple of bloggers mentioned enjoying her Craftsy class. I was immediately taken with the photographs of her quilts and signed up for the class. After that I became somewhat of a super-fan and bought every single one of her books. The one that holds the most special place in my heart is Quilting from Little Things, if only for this quote: “You will notice that I don’t list solids as essential in my stash. That’s because, as a rule, I don’t use them.” I can picture how my face must have looked when I read that and the thoughts that must have gone through my head. “What? Seriously? That’s allowed? Is that why these quilts look so interesting to me?” Changed my life. Oh, you think I’m exaggerating? I’m really not. I was rather a newbie at the time and very influenced by traditional quilting decrees like “you must include solids so the eye has a place to rest” and then by modern decrees about “graphic areas of solid color” and “expansive negative space.” As always, I don’t mean to imply that those are not valid decrees. They just didn’t click for me. When I started using prints for my background fabric it was a big step toward finding my personal quilting style – making quilts that I love. Generally I get more inspiration from just studying every picture and word of my quilt books rather than actually making the quilts. But I have made a couple of small projects from the book and the Craftsy class. Just looking at that makes me want to do another appliqué project! I blogged about it here. In this project I was testing quilting with linen and voile. You can read about it here but don’t miss the follow up here. It might be obvious (but it’s a book review so I guess I should say it): I would definitely recommend this book for your quilting library. I’d rate the projects as intermediate to advanced in difficulty, but completely doable for someone who has made a couple of quilts. It’s perfect, really, for quilters who want to try new and more complex techniques. As part of Book Review Tuesday Michelle always gives away a copy of the book! How generous is that? So of course I will follow her tradition and give away a brand new copy of Quilting From Little Things. This giveaway is going to stay open a little longer than usual because I’ll be out of town and without internet access. I’ll draw a winner Monday, February 24 at 9 am EST. The giveaway is open internationally and you don’t have to be a follower to enter. Just leave a comment. You can tell me about your quilt idol(s) if you want! I’ll be back briefly tomorrow to share my first gypsy wife block and some words of encouragement for my barn door quilt along participants! 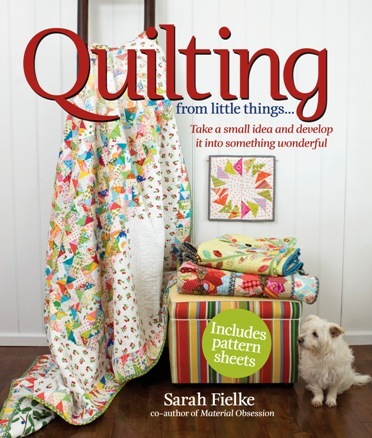 This entry was posted in Uncategorized and tagged book review, Quilting from little things, Sarah Fielke. Bookmark the permalink. I own all the Material Obsession books , Sarah’s independent books, and the class, too. I am fascinated by her style and techniques even though I haven’t made anything from them and have a very different style. Like you, I simply love reading and studying the books whether or not I ever make any of the projects. Sarah Fielke’s Quilty class is on the top of my wish list. I am not a big fan of using a lot of white for backgrounds…I would much rather use low volume or text prints or a medium grey.solid. Thank you for sharing! I love Elizabeth Hartman’s work – I have one of her books. When I received Quilting Modern, by Jacquie Gerring and Katie Pedersen, in the post I felt like crying – it was the book I had been waiting for/searching for, without realising I was waiting or searching for it, I just wanted to hug the book for weeks. And like you, I think I learn more from reading it and studying the pictures than from actually making one of the projects in it. I don’t have any one artist that I prefer over any others but those who use minimal solids and lots of scraps are definitely my favourites! I love variety so I have a many different quilt artists I love! Elizabeth Hartman and Julie Herman are two I really like ! thanks! I don’t like to use solids much either, I would love to see how she “avoids” it! It’s funny, I have been quilting a couple years and am just now picking up solids. They just aren’t as exciting as the beautiful patterns out there. I think this book looks like a ton of fun! I would have to say I have a lot of quilting idols, Carolyn Friedlander and Elizabeth Hartman are the two that I can think of off the top of my head. Fun review! Just starting my quilting career and this looks like it would be a great book to start my collection. Enjoyed the review Sarah. What a nice review. Being new to quilting, the projects may be above my skill level at the moment but that doesn’t mean I can’t aspire to them! Would love to add this book to my collection. Thanks! I remember being equally as excited about that quote when you shared it- I’ve loved all of your projects which prove this “rule” have fun!!!!! I’m not much of a solids fan either so I would love this book for some inspiration! I am fairly new to quilting. I’ve sewn clothes for my kids and home decor items. My youngest is 14 so the idea of wearing something hand made is out of the question. My love of sewing and my addiction to fabric led me to the next best thing, quilting!!! I have no quilting icons that I follow as of yet. 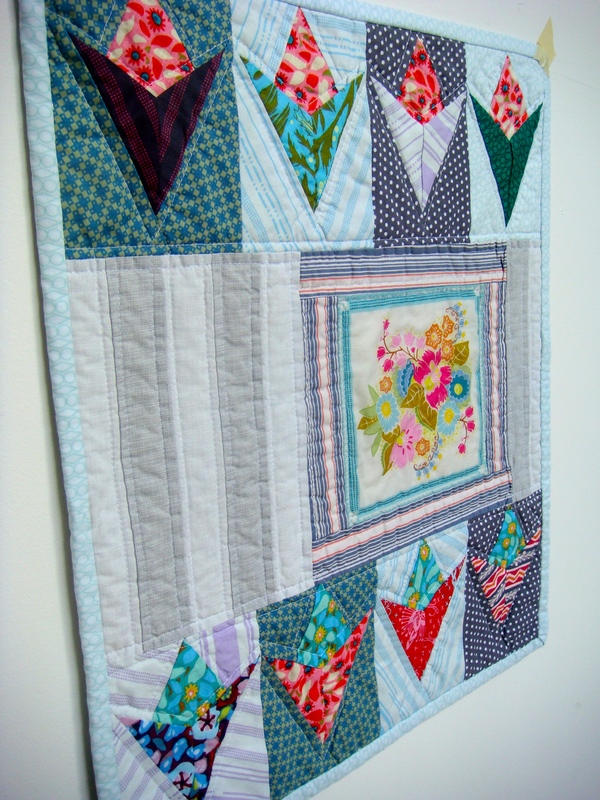 I do find myself reading quilting blogs for hours to gain insight and inspiration. I even have a board on Pinterest dedicated to the blogs I follow. I would love for this book to become the first in a collection I have yet to start. Thanks for the opportunity. I enjoy reading your blog and love the work you do with fabric! !